Earn your Dive Certification in just a few days of adventurous diving in Cancun. If you can breath through your mouth and move your legs you can scuba dive! Take advantage of your Cancun vacation and learn this life changing sport. 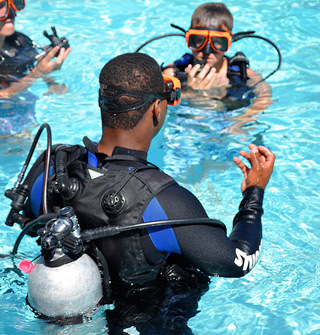 Scuba Diver Course: With this course you can dive to a maximum of 40ft without the supervision of a professional. Open Water Certification: Become fully PADI certified to dive anywhere in the world. Referral Course: 4 dives are needed for the Open Water certification. You can save money by doing the classroom instruction in your home town and just do the ocean dives in Cancun. Don’t forget to bring your REFERRAL LETTER from your instructor. If you want to dive without all the fuss, book the Beginner Course and dive today! Quick and easy way to start diving today! 2 dives to get certified. PADI Open Water Certified in 3 days! 4 dives to get certified. Do the classroom work in your hometown, then do 4 dives in Cancun to become certified. All dive courses include Padi manual, log book, dive planner, all gear and instruction by our dive masters. Price DOES NOT INCLUDE $3 per person reef tax. Certified Divers only. If you are not certified, book the Beginner Course or PADI course. All equipment is provided: mask, snorkel, fins, BDC / regulator, tank & weights. You can rent a wetsuit or shorty if you need one. Underwater Museum dives are Wednesday, Friday & Sunday afternoons. To Cancel: Call us local in Cancun 998-273-2970 or email us at trina@cancunandrivieramaya.com. Less than 48 hours before tour time, still call us. We'll do what we can to get your refund.